This is an excerpt from an article by Pam Kragen, you can read the full text here. “CARLSBAD — A group of adult carousel riders dressed in Victorian gowns, morning coats, bowler hats and pith helmets were kicked out of the Westfield Plaza Camino Real mall last week because security guards claimed their costumes violated mall rules. 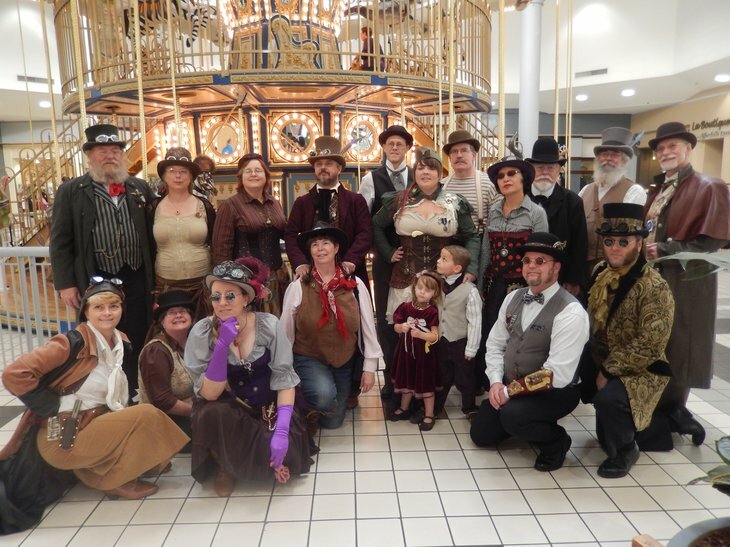 About 25 members of the loosely organized SD Steamy Carousel Cavalry met at 1 p.m. Feb. 9 to enjoy the indoor mall’s old-fashioned, 18-animal carousel. But before the group of nattily attired adults in their 30s to 60s could mount the painted horses, bears and giraffes, a trio of mall security officers ushered them outside and called Oceanside police to ensure against a ruckus in the parking lot. Members of the costumed group are furious over their eviction. Check out the rest of the article, including the petition this incident has sparked here. This entry was posted on March 11, 2014 by Phoebe Darqueling. It was filed under Reblogs and Miscellaneous and was tagged with Carousel Cavalry, steam punk, Steampunk, steampunk blog, Steampunk news. Wow – that’s rather shocking, actually! After all, there’s plenty of “everyday attire” out there that’s way more inappropriate than steampunk costumes! I agree! I hardly believed it when my dad told me about it (though he did say it happened in Florida which made it more plausible in my book).